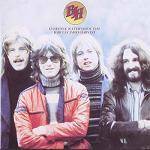 More information: Newly re-mastered and expanded edition of the classic 1974 album by BARCLAY JAMES HARVEST, “Everyone is Everybody Else”. Originally released in June 1974, the album was the band’s first for Polydor records and followed on from four albums recorded for EMI’s Harvest label. The album has now come to be regarded as one of the band’s finest, featuring such classic songs as ‘Child of the Universe’, ‘Crazy City’, ‘For No One’, ‘The Great 1974 Mining Disaster’, ‘Negative Earth’ and more. “Everyone is Everybody Else” would also introduce the band to a much wider audience both in Britain and abroad and would lead to a highly successful series of albums that continue to endure. This Deluxe edition includes two CDs and a DVD, and features a new re-master of the original album mix, along with stunning brand new stereo and 5.1 surround mixes of the album (with the exception of ‘For No One’ – omitted due to the multi-track master tapes having long since vanished). The set also includes new stereo and 5.1 Surround sound mixes of a different version of ‘Child of the Universe’, recorded in February 1975 for an American single release. The DVD (which is region free and NTSC) also includes 96 kHz / 24-bit stereo re-mixes. In addition there are five further bonus tracks comprising two early 1974 mixes of ‘The Great 1974 Mining Disaster’ and ‘Negative Earth’, along with two alternate single versions of ‘Child of the Universe’.